They’re not just baby toothbrushes—they’re sidekicks. 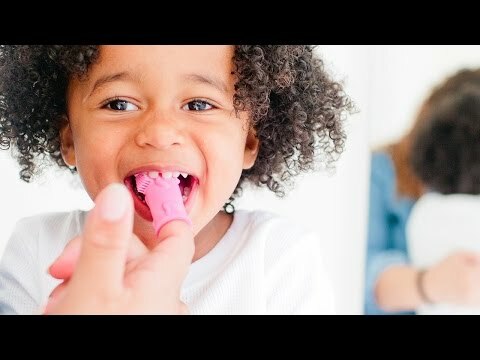 Made from BPA-free, food-grade silicone here in the USA, Momo, Chomps, Pinkey, and Willa help kids embrace brushing. Pick your favorite character (each comes with a storybook full of playful rhymes and personality). Two moms—one a psychologist and the other a dentist—transformed this chore into an imaginative adventure. I gave as gift, haven't received feedback from parents of child. But I definitely love this for young ones learning to brush their teeth. My youngest grandson loved this book and I believe he’s gotten a good start to taking care of his teeth. Very cute product. 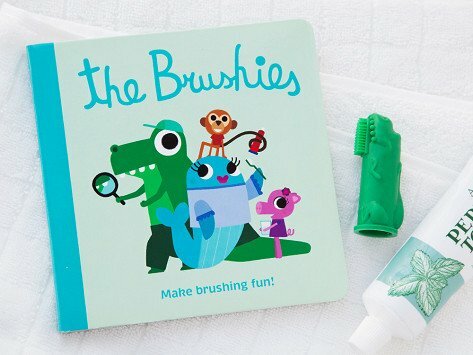 More than a baby toothbrush, The Brushies are colorful characters who are eager to help kids embrace brushing. These Made in the USA, food-grade puppets can put on a show—easily narrated with a related storybook—that engages little ones. Not only will it help them understand the need to brush and how to do it, it just might lessen their all-too-common resistance. Moms Hilary Fritsch and Colleen Crowley combined their expertise in psychology and dentistry to transform this mundane task into an imaginative adventure. It’s never too early to usher in good routines. Kids can start as early as four weeks (with help from Mom or Dad) and use Brushies all the way up to four years old. By then, they’ll be glad to graduate to big kid brushes.